Ignorance of the gun carry laws has reared it's ugly head once again. People break the law unintentionally because they were negligent in knowing the law and understanding it. I know it's harsh, but far too many people think they have a grasp on the law when they know just enough to get themselves in trouble. This could all be solved by people reading and understanding. Unfortunately, many people don't take the time to do so or assume they know it all. Public buildings are government owned and operated buildings, not private property open to the public. 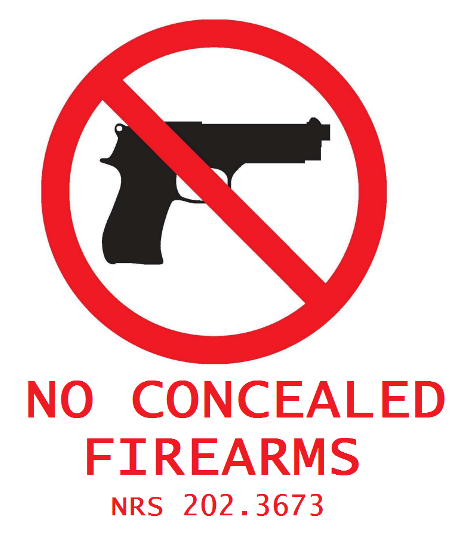 "No gun" signs do not have the force of law in Nevada; except for concealed carry in public buildings. Open carry is 100% legal in all public buildings but for school/college/university or child care facilities, no matter what the sign or staff says. So if it's a government building and there are signs or metal detectors at each public entrance, concealed carry is illegal. Don't carry illegally past the signs anyway and certainly don't brag about it online or to the local news media. Staff in government buildings often don't know the law. The same goes for police. Open carriers may face harassment simply because the staff don't know better. It is your duty, however, to know better. Not taking the time to make certain you understand the law is laziness. There is no excuse whatsoever for not properly knowing the law and understanding it. If you do not understand this stuff, you shouldn't be carrying and you sure as heck shouldn't be forcing the issue anywhere. Know before you go or face the consequences. Ignorance of the law and stupid behavior by people who have little to no reading comprehension skills will make winning back our rights more difficult. I'm pretty riled up at this stuff, so please don't take it personally. Two Reno-area concealed carriers, Justin and Domonique Bailey, recently admitted to My News 4 that they violated state law by illegally carrying concealed in a public building. Both claimed not to know it was illegal because they were not properly searched by security guards and only saw the "no guns" signs after they left the basketball game they were attending at the Reno Events Center, operated by the Reno-Sparks Convention and Visitors Authority, a government entity. 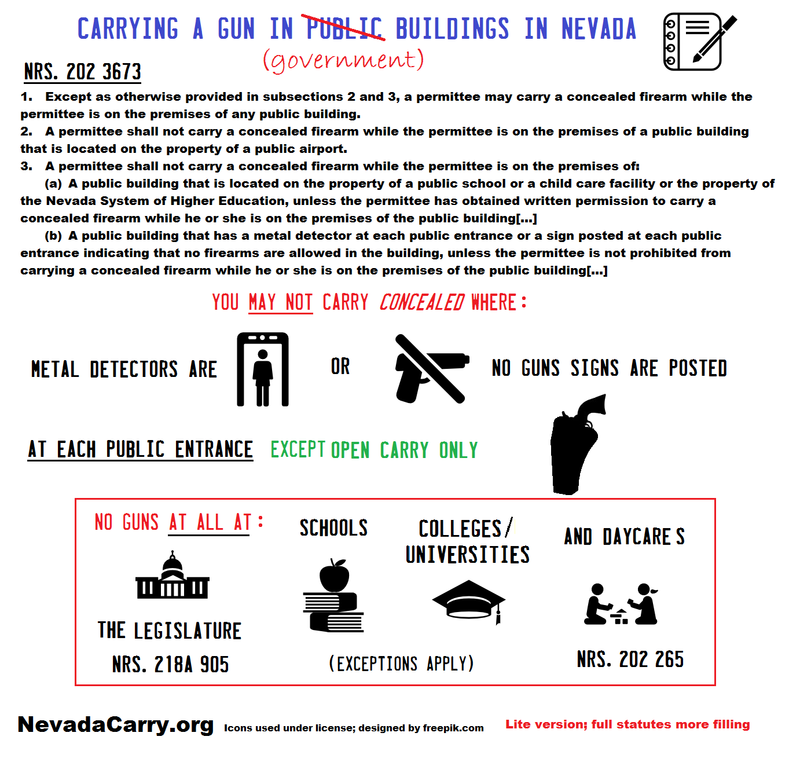 Banning concealed carry in public buildings is discretionary in Nevada. The Baileys claim that they did not see the signs is not an excuse for their willful violation of state law. They either knew or should have known that concealed carry beyond the metal detector was illegal. Signs are a nice reminder in this case, but not required because the security screening and metal detectors are warning enough. Simple ignorance of the law (they never read the relevant section), or negligence to properly understand the law (didn't pay attention in CCW class), is irresponsible and inexcusable. As self-admitted concealed firearm permittees, the Baileys were required to take an eight hour course which explained NRS 202.3673, which prohibits concealed carry where there is "a metal detector at each public entrance" or "no gun" signs. The fact that metal detectors are used for weapons scanning is meant to be a commonsense understanding that weapons are prohibited. Security isn't checking for contraband popcorn and candy. As concealed firearm permittees, the Baileys have an obligation to know and follow the law. Just as gun rights activists and citizen carriers require that the government respect our rights, particularly that of open carry, every concealed carrier has duty to obey the law as well. My speculation is that they didn't fully understand the law and didn't make any effort to fully understand it. I get emails all the time asking simple questions that indicate either a failure to read the website or an absence of reading comprehension skills. Stupidity is not an excuse. This incident occurred back in February, but a news interview by the head of ESI Security prompted the Baileys to come forward, as they told My News 4. Perhaps they were truly concerned about the lax security and unprofessional guards. Whatever the reason, the Baileys made two very stupid mistakes. Certainly, if they were able to lookup the CEO of the security company and contact him, the Baileys were competent enough to do their due diligence to double check the law to realize that they had indeed broken it before admitting to it on television. Confessing to their violation of the law, a misdemeanor, within the statute of limitations is a very foolish idea. The Baileys exposed nothing but their own ignorance. If they took umbrage with the quality of ESI Security, there are other methods to raise their concerns. One wonders what would have happened had ESI discovered the firearms; perhaps Washoe County District Attorney Hicks or City Attorney Hall would have secured a plea bargain by now. As for NRS 202.3673 is concerned, the law is absurd. It seeks to disarm those who have been trained and vetted for the carry of firearms. Ironically, concealed carry in a prohibited public building by a non-licensee (someone carrying concealed illegally) is not a violation of this section. As a whole, concealed carriers are typically more law abiding and less violent than even police officers. Security screening is often just security theater, meant to deter the undetermined and provide an comforting illusion of security. 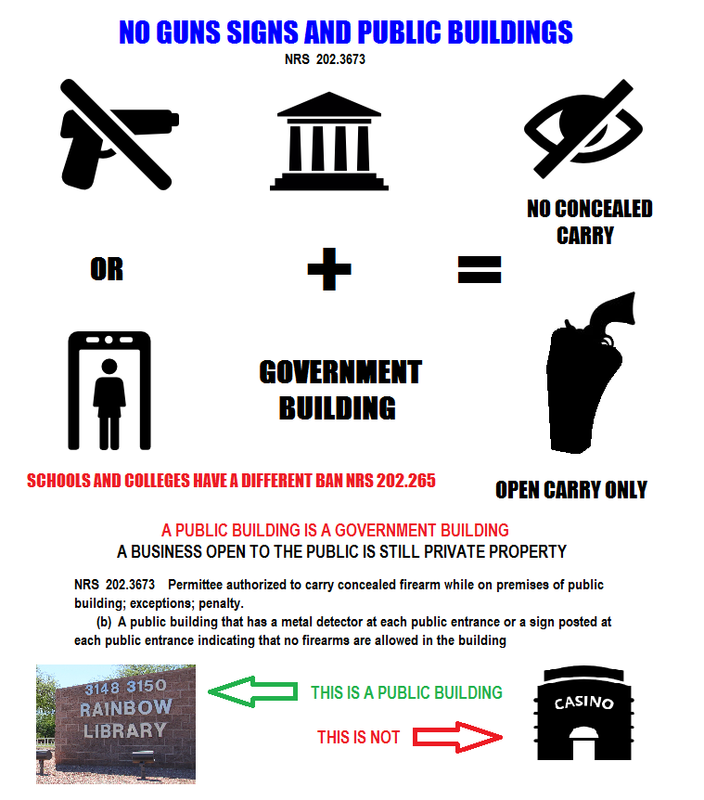 Banning licensed concealed carry in public buildings does not enhance safety. Criminals and terrorists remain undeterred, especially when coupled with ineffective security measures. Disarmed citizens then become easy prey for killers. Even if security is beefed up to make carry within the venue unnecessary, criminals can target persons on the surrounding streets and parking lots while terrorists can attack the security lines or congested areas outside, as we have seen recently in Manchester and in the Brussels airport attack. 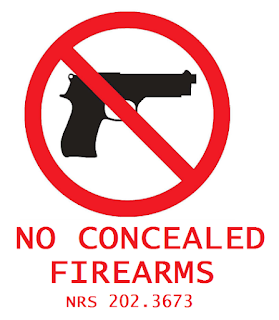 NRS 202.3673 needs to be replaced by explicitly allowing open and concealed carry in public buildings, excepting places like courthouses and detention facilities with mandated lock-boxes at the entrances. No convention center, school, library, city hall, etc. is safe because law-abiding, trained, and vetted gun owners are disarmed inside. As far as the Baileys, if they are so ignorant of the law that they are required to know, and dumb enough to admit to it on TV, do they deserve to have CCWs if they can't follow the terms? As much as I disdain the idea of a permit to exercise a constitutional right, perhaps a permit revocation and fine would make an example of the Baileys pour encourager les autres to know and follow the law. Again, if the gun community demands the government follow the law to the letter, than so must we, consequences included. Know before you go. With instructors and a resource like NevadaCarry.org, there is absolutely no excuse for gun owners to be ignorant of the law. Unfortunately, far too many armed citizens exhibit a dearth of knowledge of our gun laws and an equal lack of interest in educating themselves and others. I have spent considerable time, effort, and money to educate Nevadans and I find it a shame that people take such a responsibility as carrying a gun so cavalierly. And for heaven's sake folks; at least email me before going to the local news and cramming your foot in your mouth. Comments from the city and district attorney offices have been requested. SB 115, the library gun free zones/open carry revenge bill has died, along with SB387, the gun violence restraining order bill (gun confiscations). Neither bill left the Assembly Judiciary Committee before their deadlines. The legislative session ends officially June 6. For those concerned with libraries respecting the law, the lawsuit appeal is pending. The legislature has spoken (favorably, for us, after a fashion) and the judiciary will as well. We need to be patient and let the legal process finish itself out. Rome wasn’t built in a day. To those who feel “something” needs to be done, your support in opposition of the bill sent the message that Nevadan’s don’t want more gun free zones, especially with such an egregious background as SB 115 had. No other actions are needed right now. As for SB387, we will see it again in some form in the next session in 2019 or on the ballot like with Question 1. Right now, we need to spread the word that pre-crime confiscation of guns is not the way to go and it will do nothing to disarm those who are a danger. Rather, it is empowering people to defend themselves against attackers or help those who need mental health treatment to get it. Taking due process away to “do something” to save lives is anti-American and will not make anyone safer. I want to thank everyone for their comments and opinions submitted to the legislators. I also want to thank the senators and the assemblymen and women who voted or otherwise opposed these bills, even across the aisle. Beyond that, I invite those who hold opposing viewpoints to speak with us candidly and see our point of view. Remember, pro-gun candidates must take a majority in 2018 or Nevada will be lost. Let’s begin turning our energy to selecting and helping to elect pro-rights candidates for our state. 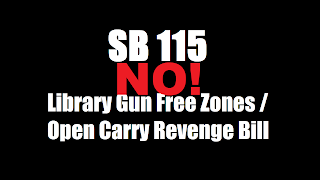 SB 115 would turn libraries into gun-free zones like schools, prohibiting guns even in the parking lots. The bill was created to “trump” challenges mounted by pro-gun activists against the Las Vegas Clark County Library District (LVCCLD), which has illegally enforced a gun ban. This came to a head when a mother, legally openly carrying her gun, was improperly arrested and filed a lawsuit based on state law that prohibits local gun rules or regulations. Despite what local media report and supporters claim, this bill exists because citizens stood up for their rights. Now, unscrupulous officials, elected and unelected, want to change the law because they don’t want to have to obey the law. Create a chilling effect on civil rights by rewarding officials who change a the law to avoid complying with it. Show the state has little interest in enforcing state firearm preemption laws. Provide no safety benefit and put law-abiding Nevadan library patrons at risk for violence. Encourage the Democrat-led erosion of Nevada’s right to bear arms. Allow the officials involved to escape responsibility for their illegal actions. Open carry in a library? Yes, state law bans licensed concealed carry in public buildings (government buildings) where signs or metal detectors are posted at each public entrance. Open carry is not prohibited. 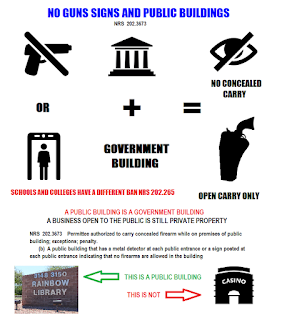 If one wants to carry a firearm legally in a library, they must do so openly. State legal experts agree. Until the 1990s, concealed carry was generally demonized, whereas open carry was constitutionally protected. Where this bill come from? For nearly a decade, LVCCLD has illegally prevented open carry in its libraries. Many incidents have been recorded of legally armed citizens, minding their own business, being kicked out. The library bureaucrats made their illegal policy without a vote by the library trustees, thus breaking another law. Citizens petitioned the district and trustees to remove the illegal ban, but the district continued to break the law. After enhanced state preemption of firearm laws was passed in 2015, allowing the option to sue for violations, LVCCLD was sued in 2016, but the case was lost in the pre-trial phase. Most preemption suits nationwide are won on appeal. SB 115 would circumvent the preemption argument by prohibiting guns at libraries totally, just like at schools. This way, no lawsuit under preemption would work. LVCCLD officials are afraid that without SB 115, they will be sued again and lose. What do the supporters claim is need for this bill? Senator Denis asserted that he feels earlier legislation mistakenly left libraries out of the law. As the above context and quote (below) from the Assemblywoman show, Denis’ explanation is an excuse and probably a lie. If Senator Denis meant the “no weapons in schools” law, libraries have never been considered like schools and no discussion was had before now. If Senator Denis meant that the state preemption law reform should have exempted libraries, why didn’t he propose a bill to amend the respective preemption laws? Denis voted “yes” on one version of the preemption laws, 2015’s SB 240, which did not exempt libraries. If there was a mistake then, why didn’t he try to correct it or vote against the bill? There wasn’t an “error” in preemption. LVCCLD doesn’t want preemption to apply to them. Emily Dickinson wrote “Tell all the truth but tell it slant,” and in this sense, Denis lied via not telling the whole truth when he stated he felt schools were “left out,” if indeed he felt that way. The bill’s co-sponsor and former LVCCLD trustee, Assemblywoman Shannon Bilbray-Axelrod, admitted to local media that pursuing a legislative fix to the gun ban protest problem would be a priority. So yes, by their own admission, SB 115 is directly because of the open carry challenge. What is state preemption and how does it apply? State preemption of firearm laws prohibits any political or government entity other than the legislature from making gun regulations, except for unsafe discharge. The law specifically applies to cities, counties, and towns, but also gives only the legislature authority to make gun regulations. This keeps all state laws uniform and avoids someone unintentionally violating a rule when traveling outside the area they are familiar with. LVCCLD claims that since library districts aren’t explicitly included that they can make rules that prohibit guns. NRA lobbyist Dan Reed pointed out that if true, a special “gun ban” district could be made and make all sorts of anti-gun laws because the statute doesn’t specifically mention special districts like libraries. Statements made by LVCCLD officials and the Senator himself indicate they are aware that state preemption does apply to them and they are afraid of losing another lawsuit. Their defense in court was that preemption does apply and got the lawsuit dismissed, partially on those grounds. So if preemption doesn’t apply to library districts, why the need for this bill? Who needs a gun in the library? One could ask this same question about a school with the response being a litany of school shootings that may have been prevented by someone shooting back. In fact, a few school shootings have been deterred or stopped by good guys with guns. If guns aren’t needed at the library, then why does LVCCLD hire armed security guards? Surely if citizens don’t need guns, security doesn’t either. No one knows when or where violence will strike. It could be a disgruntled employee, a random attack, or ordinary criminal violence. It can also happen outside the library. Many open carriers cannot afford the training and fees for a concealed weapon permit, so they have no choice but to carry openly. Since they choose to protect themselves in public, why should they be forced to decide between going to the library unarmed or not going at all? What makes a library such a special place that guns should be forbidden there? If mass shootings occur in churches and schools, there is nothing sacred or special about a library. Legally armed citizens do not manipulate their firearms in public or leave them in reach of children and neither has there ever been an recorded act of violence by a legally armed Nevadan in a library here. Without evidence of legally armed citizens causing a problem, why is a ban needed? And with the context of all the illegal behavior of LVCCLD, should we really excuse everything they’ve done wrong by passing this law? What about the parking lot exemptions? The proposed parking lot exemption was proposed because opponents of the bill pointed out that those dropping off books or otherwise using library parking lots would be affected, as the law in question prohibits firearms any part of the property. This is a cop out, not a good thing. The exemption is meant as a feel-good measure to overcome objections without actually doing anything. Schools will not create a pro-gun parking lot policy and one cannot trust libraries like LVCCLD to make fair policy in favor of gun owners. On the other hand, should the exemption become law, it would be a good start for parents and students to lobby for parking lot firearm exemption policies on campus. SB 115 cannot be allowed to become law. A gun free zone is a killing zone and bureaucrats should never be rewarded for breaking the law. 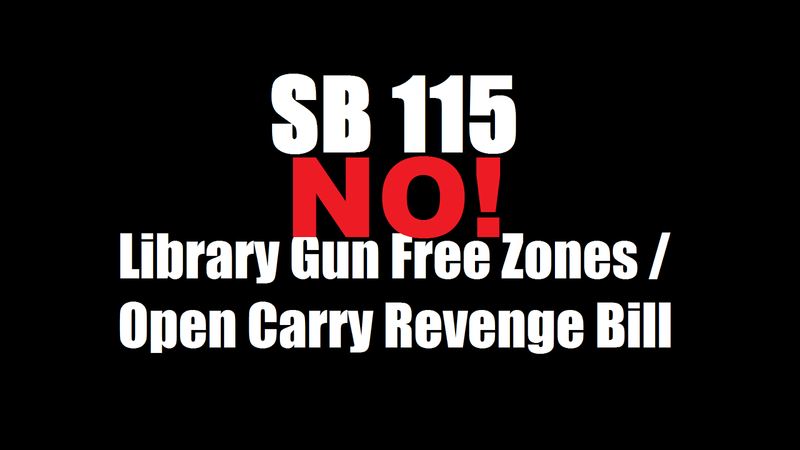 Remember SB 115, the library gun free zone/open carry revenge bill? Well, the Assembly Judiciary Committee held its hearing on the bill Tuesday, May 10th. Guess what came out of it? A Democrat who supports campus carry! Earlier, we predicted this as a possible outcome. Senator Denis’ proposed an amendment which amounts to campus carry lite. Under his amendment, it would be legal at many schools, college/universities, libraries, etc. to openly carry or carry concealed in the parking lot or have a gun in your car. That’s right; Senator Denis approves of citizens having guns in plain sight on campus. Basically, what his amendment does far surpasses SB 102-the dead parking lot exemption bill from Republican Senator Settlemyer which only decriminalized guns in locked or occupied cars. Under Senator Denis' amendment, schools, colleges/universities, and libraries would have a blank check to be as pro-gun in the parking lots as they wanted. One of the major objections to SB 115 was regarding books drop-offs or taxi and rideshare drivers inadvertently breaking the law by going into a library parking lot. The caveat is that such a policy would be discretionary and creates an illusion of a solution. Denis’ intended “checkmate” to overcome these objections back into basically the same problem he faced before. Libraries could easily ban such conduct if they wanted, and libraries making up the rules as they go is the whole problem here. The first problem is that the policy to create the exemption is not mandatory, meaning that a library wouldn’t have to a parking lot exemption at all. Even if they did, it could be as narrow or broad as they liked. If libraries wouldn’t follow the law now, do you trust them to make an exemption to protect you now? This is a cop-out from a mandatory parking lot exemption because Denis’ made a huge mistake in tying libraries to schools. He can’t make a mandatory exemption to library only parking lots because it would make him a hypocrite on his alleged reasoning of the “need” for SB 115. If he applies it equally, as he is claiming he is trying to do with his law, he creates de facto campus carry. As this bill stands, many pro-gun and rural schools, libraries, etc. 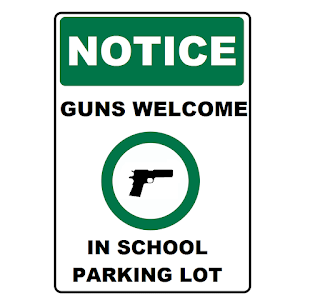 could very easily make very liberal parking lot carry policies allowing even open carry. If this passes as-is, it will lead to more and more schools and etc. adopting pro-gun policies, slowly bringing down the wall of resistance to true campus carry. Does Senator Denis really want to be known as the guy who got the campus carry ball rolling in Nevada? Even if he amends his amendment, he falls into one of the traps we’ve outlined before. It’s a no-win situation for Democrats. Second, this amendment goes against the whole idea of state preemption of firearm laws, which has been in effect since the 1980s, that is a patchwork of policies are a bad idea. Optional policies, the terms of which can be broad or narrow and set individual, are a can of worms. Without extensive prior research, there would be no telling if it is legal to cross that threshold from the street or not. These “policies” adopted could vary so widely that any supposed “advantages” may be meaningless. The amendment raised questions as to how such a policy would be implemented. Will a library district exempt some branches and not others? 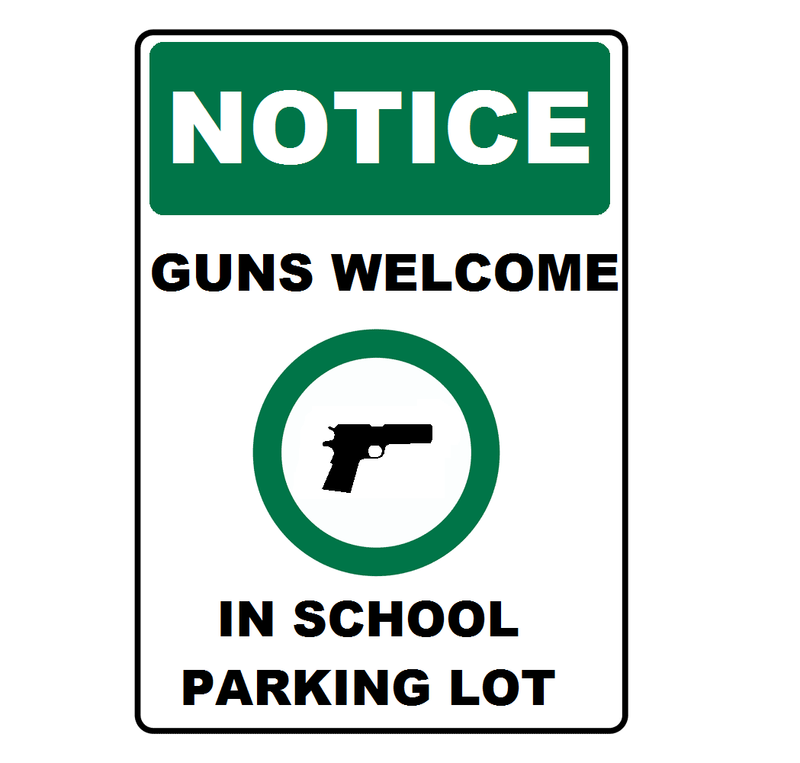 Will certain schools or school districts be okay with guns in the parking lot? 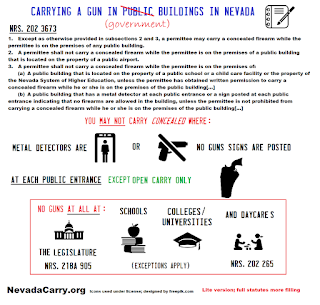 What if the Henderson libraries ban guns in parking lots, but LVCCLD does not? How many citizens could accurately tell you what district a library belongs in? And who will oversee the policies to see they are fairly implemented? The LVCCLD board of trustees totally ignored its administrators flagrant violation of the law. If we cannot trust LVCCLD to obey state law in the first place—to the extent they try to re-write it altogether to justify their crimes—how can we trust them to implement a fair policy? All they had to do was acknowledge the fact that open carry is legal in a public building and leave it at that, but instead, at every opportunity, they chose to do the wrong thing. With this kind of track record, they have shown they are unworthy of discretion, not to mention there is no legitimate need for this bill. Once again I remind the reader that SB 115 exists because citizens dared challenge LVCCLD’s illegal ban on legally openly carried firearms. SB 115 would set a horrible precedent that would encourage government officials to violate laws they disagree with, then pass laws to condone their behavior once citizens challenge the law. In a democratic and constitutional society, this amounts to tyranny. Any statesman or jurist of repute cannot allow this behavior. Today, it might be gun free zones in libraries. Tomorrow, it could be anything you can imagine. At the very least, should the worst come to pass, those in rural counties or with right-minded principals and trustees might have Senator Denis to thank for campus carry lite. The bill is up for a work session next Tuesday, March 16. Learn the history behind the SB 115 and the illegal activities of LVCCLD. You can use the email links below to email members of the Assembly Judiciary Committee. The anti-gun machine is hard at work trying to blame Attorney General Adam Laxalt for the failure of Question 1; the anti-gun "background check" initiative that would have banned private gun sales. 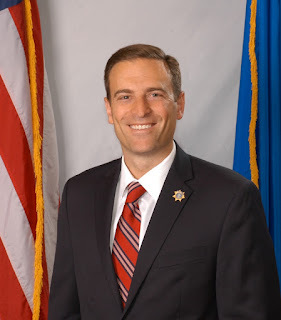 In an editorial in the notoriously leftist Las Vegas Sun, an unnamed editorial writer, probably part of, or at least well-connected to, Bloomberg Inc. gun control, is trying to blame Laxalt for the initiative supporters own mistakes. This isn't about guns; it's about the governorship. As you will recall, the attorney general determined that Question 1 could not be implemented because it required the private sale background checks to be run through the federal NICS system, which is run by the FBI. The FBI told Nevada via the attorney general that since Nevada, by legislation, chose to establish its own Point-of-Sale (POS) contact center in-state for gun background checks, that the FBI is not responsible for running Nevada's Question 1 mandated sales. Some states do split long gun and handgun background checks along state and Federal lines, but none split private and retail sales that way. In short, the FBI will not run the background checks as they are not being paid for it and a Nevada voter initiative cannot force the federal government to do anything. The FBI refused to be part of Question 1; Laxalt only asked the question and thus the anti-gunner's blame. The anti-gun attorneys, more than likely closely affiliated with the Bloomberg anti-gun groups that have been pushing this law, state by state, made a serious error. They failed to check with the FBI before crafting the text of the law to confirm the FBI would participate. The alleged reason the federal system was chosen was because it is free; supporters feared that the initiative would be defeated if gun buyers had to pay for their own background checks, which is crap because dealers do and the initiative allowed them to charge a transfer fee for having to do the paperwork and make the phone call. Those screaming for a "fix" are the ones that screwed up. All Laxalt did was uphold the time-honored principle that if one cannot comply with a law or find an alternative to exercise a right, the law is unenforceable. What the frankly stupid crafters of this law did was create a Catch-22; citizens can't buy or sell privately without background checks, but they can't get private background checks in compliance with state law. Laxalt pointed out that well-established case law said "You can't do that." If his opinion was incorrect; why haven't the Bloombergites sued to have it implemented? The reason is, Laxalt was entirely correct and the anti-gunners were wrong. Case law is on our side. Returning to the blame game, leftists and the anti-gun machine is trying to blame Attorney General Laxalt because he is a strong conservative candidate for governor. Since the anti-gun and Democrat election machines are all part of the same game, opponents of Laxalt want to try to hang the anti-gunnner's failure around the neck of the wrong man. Since Bloomberg Inc. can't admit they made a huge mistake and wasted upwards of $20 million dollars, they are trying to leverage their failure into sinking a Republican candidate. The anti-gun and leftist groups are trying to blame the victim. The Sun's editorial exhorts Laxalt or "someone" with power to force the alleged mandate through. "Leave no stone unturned. Pursue all viable options. Figure. It. Out." In other words, they want the legal and legislative processes ignored to fix their mistake. Break the law to enforce the law. Madness. What they would like someone to do is to force all private sales to go through the state system in violation of what Question 1 explicitly requires or force all private sales to stop. Democrats do have the power to implement the fix, but they refuse. Question 1 came up because Governor Sandoval vetoed the legislature's private gun sale ban in 2013. A ballot initiative is hard to overcome--it's set in stone for three years. If the Democrats were serious about fixing it, they would have proposed a legislative fix. They could require Nevada to switch to the FBI system entirely or pass an enforceable duplicate version of the law changing the requirement from the federal to the state system. But Democrats and anti-gunners know they are on thin ice. Sandoval would certainly veto such a bill as he did before. Democrats barely hold a majority and cannot override a veto without senators crossing party lines. On top of that, they know, despite their lies, that Question 1 passed with a slim margin of support, only about 9,000 more "yes" votes and only succeeding in Clark County. In every other county, Question 1 failed. Looking demographically at the state, where Clark County is an urban area filled with Californian expats and minorities that lean Democrat, it is not surprising that these folks who are unfamiliar with gun laws could be swayed by a massive campaign of lies and misinformation. $20 million bought something far less than a mandate. This is like Republicans saying that the Anti-Minority Initiative should be implemented, the 14th Amendment be damned, because 50.45% of Nevadan's voted yes to disenfranchise certain races, then blaming the attorney general for daring to uphold established legal principles. With less than 1% of the vote, Question 1 was hardly a mandate. You don't shove something down the public's throat that half the voters opposed. It's time to listen to the 548,732 disenfranchised voters and ignore the anti-gunners who are making this an issue to torpedo Laxalt's upcoming campaign. If Democrats win the governorship in 2018, Nevada will be lost and begin its transformation into California East. No one will be left to stop the bevy of unsupported, anti-gun laws that will be crafted without abandon. If Nevada is to remain the state we've known, the only option is to vote for Laxalt and Republicans.